Artist's impression depicting two spacecraft concepts for the PLATO space observatory to hunt for alien planets. PLATO is a European Space Agency telescope set to launch in 2024. The name is an acronym for "PLAnetary Transits and Oscillations of stars." The overall goal of the mission is to figure out under what conditions planets form and whether those conditions are favorable for life. To do this, PLATO will seek out and investigate Earth-size exoplanets, especially planets that orbit in the habitable zone around sun-like stars. (The habitable zone is usually defined as the area around a star where there is enough energy for liquid water on a planet's surface, although habitability also depends on other factors such as star variability.) It will determine how big their radii are; verify the mass of the planets from ground-based observatories; use astroseismology or "starquakes" to learn about a star's mass, radius and age; and identify bright targets for atmospheric spectroscopy along with other telescopes. If all goes to plan, the mission should be able to provide detailed information on hundreds of rocky and giant planets, providing more information about how solar systems form generally. PLATO's primary mission is expected to last four years. However, the telescope is designed to last 6.5 years and its consumables, such as fuel, are expected to last about eight years. This means that the telescope could continue operations if its science mission was extended. PLATO, which is named after the Ancient Greek philosopher Plato, was first proposed in 2007 after ESA put out a call for its Cosmic Vision 2015–2025 program. Cosmic Vision is the name of the current phase of ESA's long-term space science missions. ESA, like NASA, solicits opinions from the science community (ahead of selecting missions) to see what areas of space should be studied next. ESA then puts out calls for missions for a launch opportunity, attracting competitors that must present their science case. PLATO was first proposed in 2007 as a part of Cosmic Visions, finishing assessment and definition phases in 2009 and 2010, respectively. ESA then put out a call in 2010 for a medium-class mission launch opportunity. PLATO, as well as two other missions — Solar Orbiter and Euclid (a mission to investigate dark energy and dark matter) —were selected as the finalists for this competition. Subsequently, Solar Orbiter was chosen for a 2017 launch date and Euclid for a 2020 launch date. In February 2011, PLATO went up against four other medium-class mission candidates for a 2024 launch date. The others were EChO (the Exoplanet CHaracterization Observatory), LOFT (the Large Observatory For X-ray Timing), MarcoPolo-R (to collect and return a sample from a near-Earth asteroid) and STE-Quest (Space-Time Explorer and QUantum Equivalence principle Space Test). PLATO was selected in 2014 for the launch opportunity, which is also called M3 (for the third medium-class mission under Cosmic Visions.) The spacecraft is now in its design phase, which will take several years before it is finalized for construction. L2 has been used before for the Wilkinson Microwave Anisotropy Probe (WMAP) and Planck spacecraft, and is also the region where the James Webb Space Telescope will operate. Since L2 is relatively unstable, the spacecraft will follow a Lissajous orbit, which is a path around the Lagrange point, and periodically use fuel to stay in a consistent orbit. The payload and science are contributed by a PLATO mission consortium (funded by European national funding agencies) while ESA provides the spacecraft, the CCDs, mission operations and part of the science operations. PLATO's goal is to watch a large sample of bright stars for months or years, and measure them to high precision. By watching the stars for long periods, PLATO will be able to discern the light curve of the star, or the variations in its light transmitted over time. Since PLATO will last four years (at the least), the primary science mission will have it observe two regions of the sky for two years each. It's possible, however, that the telescope could instead do one long-duration observation of three years, and then move around in the sky for the fourth year of its primary science mission. 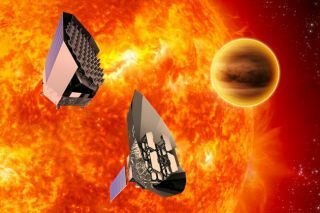 "In view of the exceptionally fast development of exoplanet science, the final observing strategy will be investigated throughout the mission development and decided two years before launch," ESA said. The long-term goal of many planetary observers is to find planets like Earth, and to seek signs of habitability on those other planets. While examining the atmospheres of these tiny planets will require a more advanced observatory, knowing where they are is a first step. Other space observatories looking for Earth-like planets include Kepler Space Telescope (in operation since 2009), the forthcoming Transiting Exoplanet Survey Satellite (TESS) and to a lesser extent, the forthcoming James Webb Space Telescope (JWST). Both TESS and JWST should launch in 2018. PLATO has 24 normal cameras on board, arranged in four groups of six. Each of these groups has the same field of view, ESA said, but they are offset by a 9.2-degree-angle from the vertical axis of the spacecraft. Additionally, the spacecraft will have two "fast" cameras that will be used for brighter stars. If an exoplanet passes in front of a star from the telescope's perspective, it can cause the light from the star to diminish, affecting its light curve. Other things can appear like planets, however, such as sunspots on the star that are darker than the surrounding surface and which also block the light. To verify any planets, PLATO will rely on backup observations from ground-based observatories. These observatories can measure the radial velocity of the star, or the velocity of the star along the line of sight from the observer. If slight tugs or movements are seen in the star, this would imply the presence of a planet due to the effect of the planet's gravity on the star. "The key scientific requirement [is] to detect and characterize a large number of terrestrial planets around bright stars," ESA wrote in a statement. Terrestrial planets, being small, are tough to see around stars because they don't dim the star's light as much. The hope is that by observing closer and brighter stars, the planets will be a little larger and easier to spot.